Traffic along Fifth Street slowed to a crawl this week with the Pacific Avenue street repairs blocking the intersection at the end of our block, so the Sun’s own MacGyver (maintenance guru John Waples marketing guru Mike Stevens climbed up on the roof) took advantage of the relative peace and quiet to sneak a little signage up on the front porch. 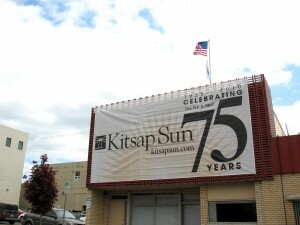 The banner more or less kicks off our 75th birthday party, which you’ll hear and read more about in the coming months. The actual anniversary is July 15, which we’ll commemorate with a special edition, possibly a community gathering, some storytelling about what Julius Gius and the other Sun founders went through in 1935, and maybe a little free booze at some point. We’ll make a big to-do about it, if the enormous sign in the picture didn’t already convey that. The timing, of course, was also planned to grab some eyeballs during this Saturday’s Armed Forces Day Parade, when the foot traffic is bound to increase as the street, sans fish statues, opens up.